The large-scale promotion activities of SBM’s “star products�?started in 2011.In August, 2011, a promotion group composed of domestic grinding mill sales department, R&D department and enterprise culture & communication department went to Sichuan province. The aim of this trip was to pay a return visit to the key customers who are using our “star products�? The "STtar products" in these promotion activities consisted of MTW Continental Trapezoid Mill and LM Series Vertical Grinding Mill. Since SBM’s MTW Continental Trapezoid Mill appeared on the market in 2009, its advantages such as high stability, high efficiency and low energy consumption have won praise from customers. In 2011, SBM introduced LM Series Vertical Grinding Mill into market，which concentrates broking, drying, grinding and classifying as a whole .Besides, it has high output at a low energy consumption. These virtues have made LM Series Vertical Grinding Mill the main product in grinding industry. During the visit, Mr. Qiu also consulted some technical questions about the running of the machine. After a careful examination of the entire production line, Engineer Zhang of R&D department answered the questions in detail. According to the failure of the dryer which was bought from other corporation, our engineer also offered some feasible advises. 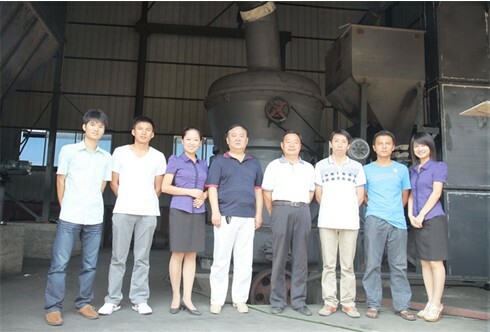 Mr. Qiu gave high praise to SBM’s high specialization, and planned to buy a second production line. Currently, made-up articles produced in this base are continuously sended to Panzhihua Iron and Steel Co, Ltd. It is reported that, after this return visit, the promotion group will carry out a series of activities such as propaganda of “star products�? promotion activities and paying back to regular customers.